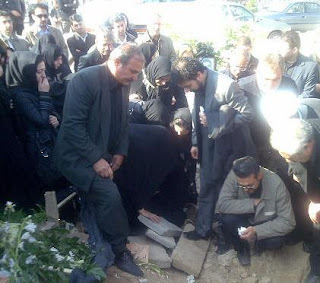 This Sunday will be yet another anniversary of the extra judicial killing of Iran's secular dissidents, Daryoush and Parvaneh Forouhar. The elderly couple were stabbed repeatedly in their home by 'The Hidden Imam's Anonymous Soldiers', the term Iran's intelligence officer operatives like to use for themselves. The daughter of Forouhars, Parastou has once again travelled to Iran to lead the commemoration ceremony on Sunday. Of course Daryoush and Parvaneh were not the only victims then. Around one hundred dissidents are known to have been killed by these extra judicial methods in the late 90s and it seems these extra judicial killings are continuing today. Twenty six year old Tabriz University medical graduate, Dr. Ramin Pourandarjani, was serving his national service at the notorious Kahrizak detention centre as a graduate medical officer where many of the worst human rights abuses against the election protesters took place. According to the reports from Iran, Pourandarjani had refused to sign papers which blamed meningitis as the cause of death for several of the detainees. He was found dead in his sleep having no history of any known illnesses. Pourandarjani's father in an interview with Radio Farda said he had not been given the autopsy record nor the death certificate for his son and nor were the family given permission to carry out their own autopsy. Dr.Pourandajani went to a special school for gifted children at the age of eleven and ranked 1069 in the whole country amongst those who took the university entrance exam in 2001. He is yet another asset from Iran wasted by the enemies of knowledge who rule Iran. It was certainly interesting for me to read that post. Thank author for it. I like such topics and anything that is connected to them. I would like to read more soon. May he rest in peace. Yet another innocent individual, an educated and conscientious doctor, a young life, lost to the ugliness of this regime. How much further are they going to fall; how much further are they going to sink? The enormous sadness of daily tragedies coming out of Iran is unbearable. Still, we are alone and alone we must fight as the world continues to ignore and to profit.